Forklift Training Course Vancouver - CSA and OSHA establish criteria for forklift safety training which meets existing standards and regulations. 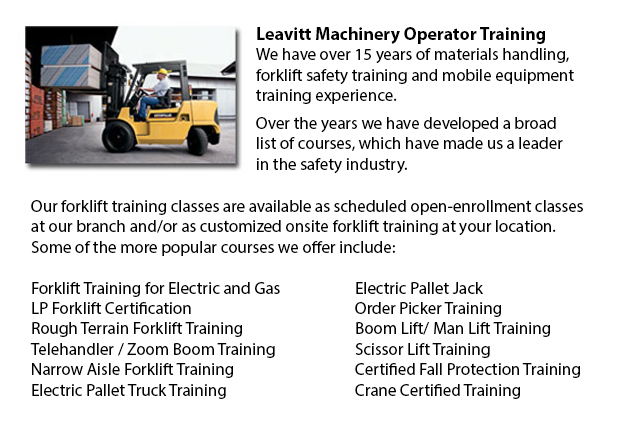 Anyone planning to utilize a forklift is needed to successfully complete safety training prior to using whichever type of forklift. The accredited Forklift Operator Training Program is designed to offer trainees with the information and practical skills to become an operator of a forklift. There are forklift operation safety rules which must be followed pertaining to pre-shift inspections, and rules for lifting and loading. An inspection checklist must be done and given to the supervising authority before beginning a shift. When a maintenance problem is uncovered, the utilization of the particular equipment must be discontinued until the problem has been addressed. To be able to indicate the machine is out of order, the keys should be removed from the ignition and a warning tag placed in a spot that is seen. Safety regulations for loading would include checking the load rating capacity on the forklift to determine how much the machine could handle. When starting the machinery, the forks should be in the downward position. Remember that there is a loss of around 100 pounds carrying capacity for every inch further away from the carriage that the load is carried. Lifting should begin with the driver moving to a stopped position approximately three inches from the load. The mast must then be leveled until it has reached a right angle with the load. Lift the forks to an inch below the slot on the pallet and drive forward. Next lift forks four inches. Tilt back the load to be able to secure it for moving. Drive the lift backwards if the load obscures frontal vision. Check behind and honk to alert other personnel. Never allow forks to drag on the ground. Forklift loads must be loaded in such a way that they are secure and do not create a danger to other people or objects. Restraining loads is necessary for materials that might shift during transport and destabilize the forklift. To avoid the shifting of drums, drums can be strapped together to reduce movement. Operators of forklifts must drive slowly when moving liquids, to lessen instability in the forklift.